Why Should You Consider Flexible Working Spaces? "Flexible working space" has become more than just a buzzword in the professional world. It’s growth and popularity over the last decade has elevated it to become a real working solution for many entrepreneurs and companies across the UK. So, why should you consider flexible working spaces? Serviced Office: A serviced office is an office that is usually owned and managed by a specialist operator, who then rent individual offices or designated floors to others. Co-Working Spaces: Co-working spaces entail a shared office environment, where individuals from different companies work side-by-side and are billed on a monthly membership basis. Hybrid Space: A hybrid space is a combination of co-working spaces and serviced offices within the same building. Flex or Flexi Space: Is usually a reference to all the above and is a term coined to identify any working space outside of the conventional lease market. All the above are typically installed with basic equipment such as phone lines, desks, chairs and internet. Moreover, per findings from ‘Instant Offices’, serviced offices were the most common flexible working space solution in the UK at 65%. And if you're considering designing a co-working space, there are many tips and tricks for office design trends which will encourage a comfortable and welcoming office environment for everyone to enjoy. For entrepreneurs and very small companies in the inception stages of their business, who do not have the finance to rent/lease an office space, a flexible working space could be ideal step. This is especially true, if the company is going to be business to business, as it will make attracting clients easier. Especially, when most potential clients will assess how competent an external service provider could benefit their own business by assessing their professionalism and capabilities. Two aspects, which a dedicated office environment would contribute towards. Additionally, a flexible working solution could be much cheaper and financially affordable when compared to renting/leasing an office. 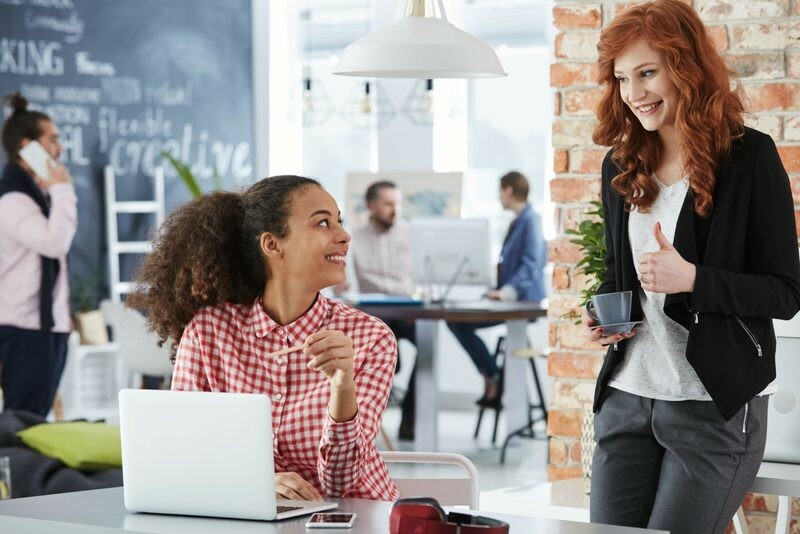 If you are thinking of going down the avenue of a co-working or hybrid space, they could provide valuable networking opportunities and may even help to boost morale. Since you are sharing the office space with other entrepreneurs and companies in a similar position as yours, they will be willing to help you out in various ways. They may use your company’s services/products, recommend potential clients/buyers, give insightful recommendations on how existing operations/processes can be improved and provide a new outlook for the future direction of the business on a micro/macro level. When setting-up it might sound like a great idea to make your home the base for all your operations, but you may quickly realise, it may not be the best idea. With ample of distractions at home such as the TV, garden and pets – the focus required to run a business may not always be achievable. Other entrepreneurs and companies in a flexible working space will inspire you to push yourself and attain desirable results. More importantly, a flexible working space will provide a set structure for you to draw a clear line between your home and work life. 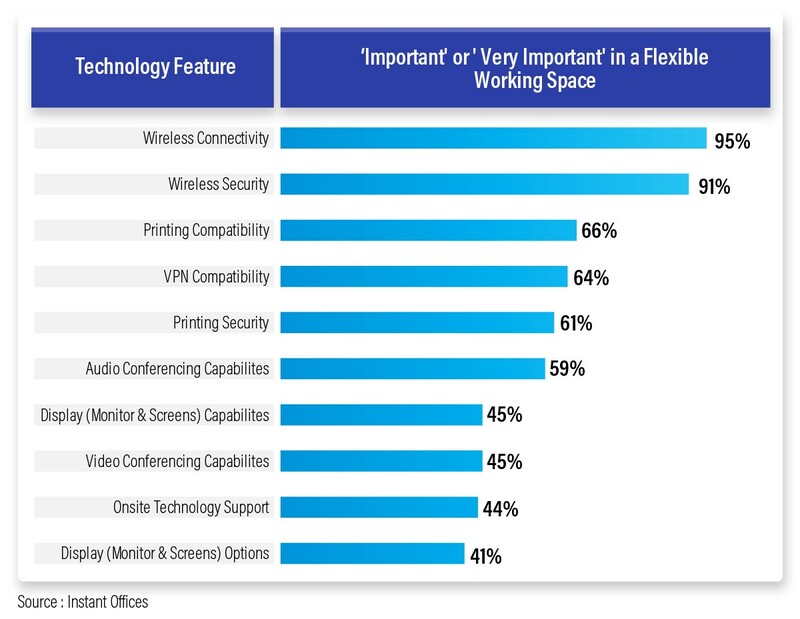 With the majority of companies now reliant on the internet and technology in some way or another to conduct their internal and external operations/processes, entrepreneurs and businesses want flexible working spaces to include important technological infrastructure such as wireless connectivity, audio conferencing, and display capabilities. Figures from ‘Instant offices’ highlight the technological features that are most desirable in a flexible working solution.